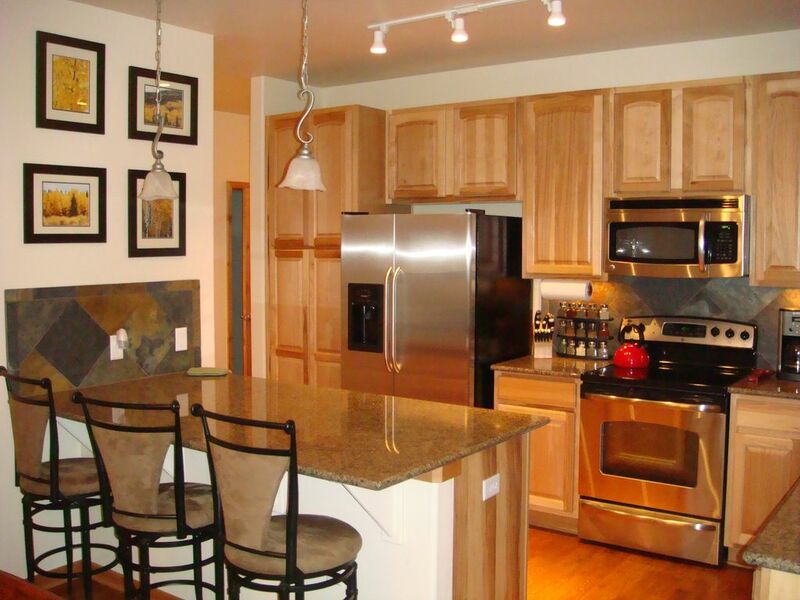 This condominium was completed in November 2008 and is ready to accommodate your stay! This finely appointed, luxury 3-bedroom 3-bath condominium is an ideal mountain vacation getaway located along the Fraser River and one block off of downtown Winter Park. Walk to restaurants, coffee, pubs and more! Enjoy the vaulted great room with fireplace, stunning kitchen, and 3rd floor mountain views - easily with elevator access right out the door. Surrounded by parks and trees, this upscale downtown location is less than one block to nearby shops, excellent restaurants (McDonalds too! ), visitor center, trails, and streams. For skiers and snowboarders, this property is also located near the resort’s winter bus line. Leave your car parked and catch the shuttle 2x/ hour – for free. Enjoy 'Hide Away Park', Winter Park's recently renovated park, right across the street. An entertainment center that includes a permanent amphitheater, playground, skate park, climbing wall, pavilion and picnic tables, restrooms and more. In the winter, a sledding hill (with free sleds) and several natural gas fire pits! This is the perfect location to enjoy the Winter Park music and beverage festivals. The Trailhead Lodges community center has a year round outdoor heated swimming pool and hot tub, work out center, entertainment area and kitchen, and gas grills for BBQ! Downtown Winter Park, CO. Walking distance to shops, restaurants, park, trails, and bars. Perfect for a family ski trip! Great place in a perfect location. Very functional for a family ski trip. Appreciated the fully equipped kitchen with island, fireplace, comfortable furniture. Loved all the hooks by the door and the large front closet - may seem like a small thing, but so helpful with ski paraphernalia. If you are looking for a condo near downtown winter park, this place fits. It is very nice and updated and within walking distance of many nice places to eat or have a drink. Has an outdoor pool and hot tub steps away in the middle of the parking lot. If able bodied, you can walk your skis about 3 blocks to the main drag to catch a bus or drive in. I believe there is also a bus that comes into the complex but we walked out the street. We really enjoyed staying here. We thoroughly enjoyed this lovely condo in the heart of Winter Park during our 12 night stay over our Christmas vacation. It was within walking distance to town, Hideway park and the lift shuttle. The kitchen was well stocked with cooking utensils, loved the heated floors, washer/dryer and the comfy furniture. Plenty of hot water for showers for everyone after a day of skiing. It is more spacious than the pictures look. The hot tub and pool were just a few steps away and enjoyable after a long day at the slopes. This unit is on the 3rd floor which Is accessible by the stairway or an elevator. The unit is also very quiet. The owners were excellent to work with and responded to any questions we had immediately. This is a great condo and would definitely recommend to anyone looking to stay in Winter Park. We stayed in the condo over President's Day weekend. It's new, clean, comfortable, and has everything you would need. I always like to stay somewhere that has comfortable furniture and a clean hot tub for after skiing...this place is it, just steps from the clubhouse that has the hot tub, pool, lounge area, and pool table. Walk to the main street restaraunts, shops, Copper Creek Square, etc. Owners were easy to work with and quick to respond by email or text, no worries. Shuttle bus to the slopes stops right out front. My partner and I, daughter and her two boys and my son stayed there over Thanksgiving 2014. First time I've lived in a place with radiant floor heating. Loved it! Excellent, well-stocked kitchen. Had we known, we could have cooked Thanksgiving dinner there. And the bedsheets! Like satin, the thread count was so high. Spacious. Well lit. Great condo in a great, central location. Would stay there again! Very easy to deal with owner and management company. Thank you for a great stay! Rates are subject to change until reservation is confirmed. Rates will be higher for special events / holidays.